One nice thing that’s happened since getting a dog is I’ve rediscovered essential oils for daily use. 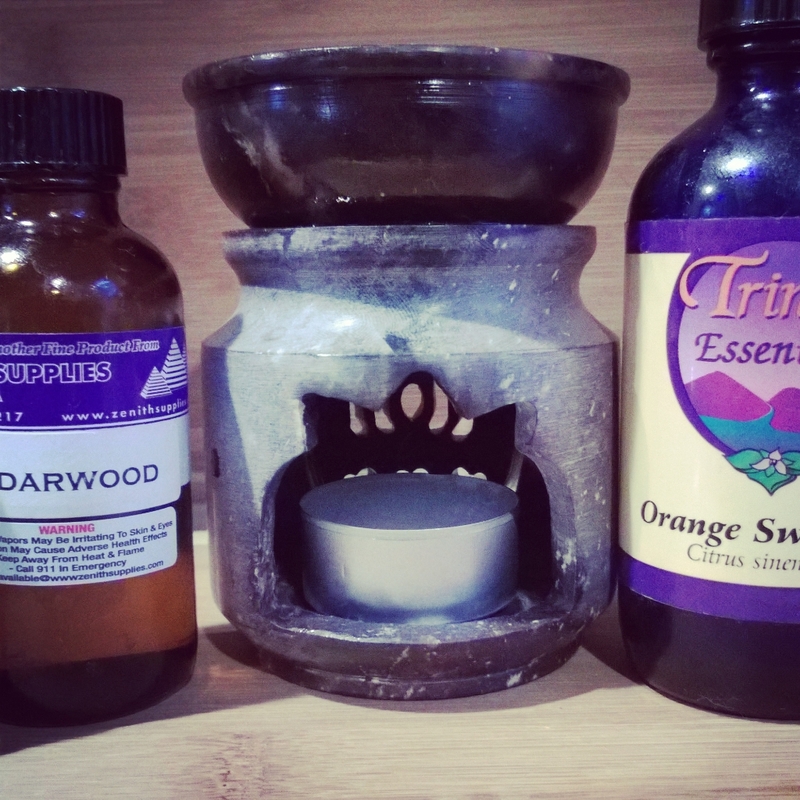 I’m waging a one woman war against dog smell and losing on many fronts, but using essential oils every day is a clear win because not only do they smell good, they are also good for our health; mentally, emotionally, and even physically. In the mornings I light up my little essential oil diffuser with rosemary helping to wake me up and get my brain going. This is especially helpful since the dog is of the working breed variety and she apparently thinks it is her job to wake me up at 4:AM every day. I’ve told her we need to renegotiate her terms of employment, but her response of pant, pant, paw, paw seemed to say, “What are you jabbering on about? It’s Saturday morning and it’s almost dawn! Get moving lady!! !” So I put on the coffee maker and reached for the rosemary. I know when I’m beat. Rosemary has a long history of being good for the brain, especially for memory. In Hamlet, Shakespeare had Ophelia say, “There’s Rosemary, that’s for remembrance. Pray you love, remember.” It’s also stimulating, antiseptic, good for circulation and sore muscles. After that takes effect, I usually add in a bit of cedar which is a bit more grounding. Later in the day I’ll switch to a couple of drops of orange with a couple drops of lavender. This sounds like an odd combination but it’s actually fabulous. Orange and actually all the citrus essential oils are stimulating and uplifting but in a calm way. If you are in the midst of January doldrums, citrus is the SAD antidote. Most people know lavender is calming and good for anxiety, but it also is good for exhaustion which might seem backwards to some people, but calm is very different from tired. I love the fact that lavender’s name comes from the Latin word “lavare” which means to wash because Romans used it for its antiseptic properties, to bathe in, and clean out wounds. Throughout history it’s been used by multiple cultures to ward of plague, illnesses, and pests, as well as to deodorize and perfume. Aura Cacia has a great article on the history of lavender which is well worth the read. When using essential oils, be sure to use authentic oils and not fragrance oils which do not have the same effects as their natural counterparts. There are many websites detailing essential oils and their many different qualities but it’s best to just go to a store that sells them to see which scents appeal to you. Have a happy, healthy weekend! Great post! I use essential oils a lot – love them! Thanks! They are so versatile and easy to incorporate into everyday life~ I love them too!